Match Watford-Cardiff Premier League the fixture is set to kick-off today 15:00 on Vicarage Road Stadium. Refereee Andrew Madley. Team Watford is located in the middle of the table. (12 place). Last 5 games (league + cup) finished balance 2 points. From 6 matches can't win a match. The best players Watford in Premier League, who scored the most goals for the club: Roberto Pereyra 5 goals, Andre Gray 3 goals, Abdoulaye Doucoure 2 goals. Most goals developed: , Abdoulaye Doucoure 4 assists. Injured players Watford: Sebastian Proedl, Adalberto Penaranda, Andre Gray, Will Hughes. The match will not occur Etienne Capoue because they are suspended (cards, etc.). Team Cardiff is located in the middle of the table. (14 place). In 5 last matches (league + cup) team gain 9 points. Leading players Cardiff in Premier League is: Callum Paterson 4 goals, Josh Murphy 3 goals, Souleymane Bamba 2 goals. Most assists in the club have: , Souleymane Bamba 1 assists. In Cardiff not occur in the match due to injury: Jazz Richards, Kenneth Zohore. Direct matches: usually ended with winning of Cardiff. 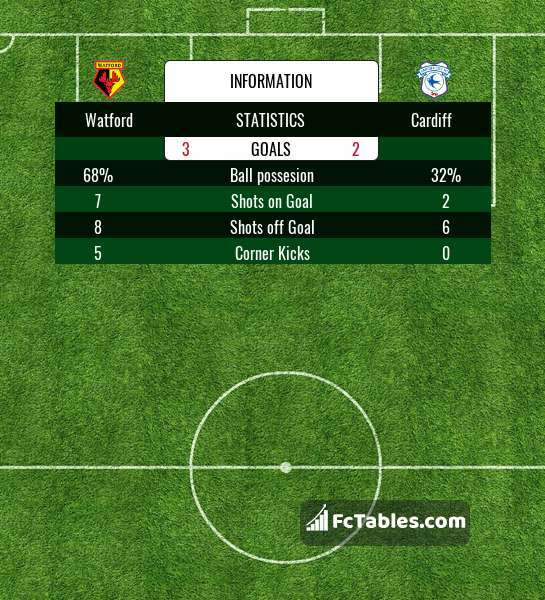 Balace of both teams games are: 7 won Watford, 8 wins Cardiff, 6 draws. In 16 matches the sum of the goals both teams was greater than 2.5 (Over 2.5). On the other hand, 18 matches teams scored more than 1.5 goals (Over 1.5). In 15 matches the both teams have shot at least one goal.